Wildhorse Casino on I-84 east of Pendleton is one of the landmarks I pass frequently on trips to and from my home on the other side of the Blue Mountains – but I don’t often find reason to stop. 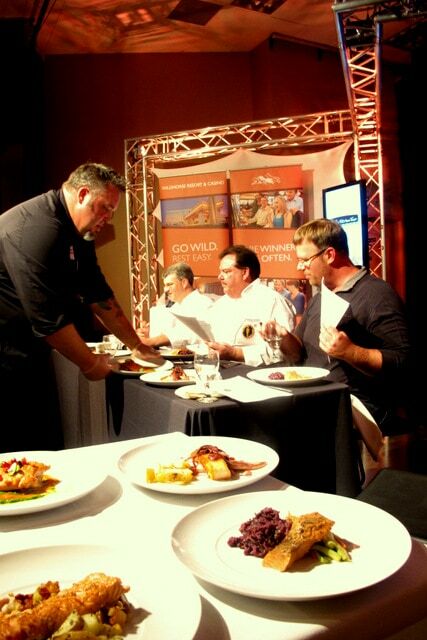 The 2012 Rez Kitchen Tour, a native foods competition on September 27th, changed all that for good. Inside the casino, I passed a movie theater, multiple eateries and rows of flashing slot machines to an exhibition space with a cooking set reminiscent of the Iron Chef. Cameras and lights, chef contestants and judges and even a celebrity chef, Amadeus — winner of the Food Network’s Extreme Chef Mexican Showdown — were all in place for a professional cooking competition based on the popular Chopped TV show. This annual event had drawn a crowd of culinary students from Walla Walla, chefs from as far away as Spirit Mountain Casino and Chinook Winds Casino, plus a host of excited spectators, including me. An ice sculpture towered above an array of wild salmon, huckleberries, sassafrass root and yellowfoot mushrooms, some of the native foods that were the basis for the dishes each of the 12 cheftestants would prepare for judging. While the chefs cooked and sweated over their cooking stations, the rest of us ambled through the exhibits of indigenous foods — all available for tasting. One booth featuring samples of both coastal and mountain huckleberries riveted me. The smaller coastal berries were tarter than those picked on the slopes of Mount Adams. I nibbled on barbecued beef short ribs and pecan tarts. But the best taste of all was right from the pot of one of the cheftestants who prepared a quick-smoked salmon with huckleberry risotto after he’d plated his finished dish. You can’t do that on TV! On my next trip toward Pendleton, I made a point to stop and eat at Plateau, the panoramic restaurant on the top floor of the casino that features many of these indigenous foods. I stopped at Tamástslikt Cultural Institute, whose permanent exhibits tell the story of local tribes. And, I tell all my friends that Wildhorse, owned by the Confederated Tribes of the Umatilla Indian Reservation, is not only a casino, but a resort and a cultural institution that’s worth checking out any chance you get.